The Macrofungi project on Notes from Nature is off to a great start!!! Thank so much to all who have contributed so far. Some transcribers have been a bit confused when there are several different bits of paper presented for transcribing. Usually there is one “official” label with the basic collection information, e.g., the name of the specimen, where it was collected, when and by whom. There may be a second label that just repeats some of the official label information. Occasionally there is even a third label, often handwritten, and sometimes quite lengthy, that is filled with unfamiliar terminology. Learning a bit more about how macrofungi collections are documented may help you to understand what is going on here. Macrofungi are usually short-lived. As soon as you pick one, it begins to change, and if left alone after picking, may become a slimy mess in an astonishingly short time. So if a mycologist (that is, someone who studies fungi) plans to make a scientifically useful specimen from a macrofungus he or she collects, there is a work that has to be done right away. First, the mycologist will take habitat photographs as shown here, sometimes picking a few individuals and arranging them so all the important parts are showing. Then he or she will make written notes about the features of the fungus that are going to disappear once it is dried, namely the odor, the color, the taste (yes, all mushrooms are tasted, even poisonous ones, but of course they aren’t swallowed!) and whether or not the fungus is dry, sticky, or slippery to the touch. 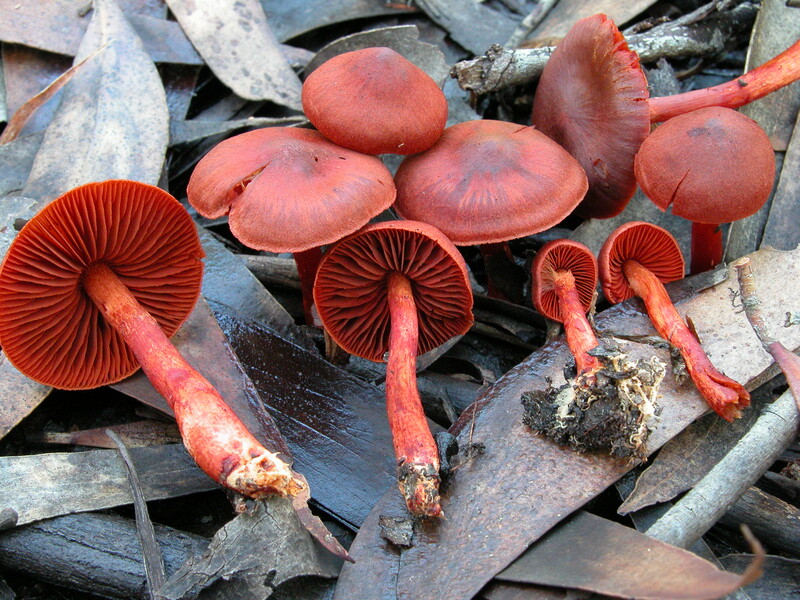 These characteristics, as well as measurements of size and descriptions of shapes are important for identifying the fungus, and must be recorded before the specimen is put on the drier. 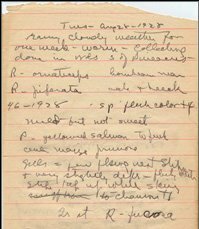 These days mycologists record these field notes on computers, but before this was possible, the information was often recorded in cramped handwriting on small bits of paper, as shown here, that could be folded up and would follow the fungus on the its journey to becoming a permanent collection. At the end of a collecting trip, the mycologist has to prepare the specimen for permanent storage in an herbarium (or fungarium, as some mycologists like to call these collections). 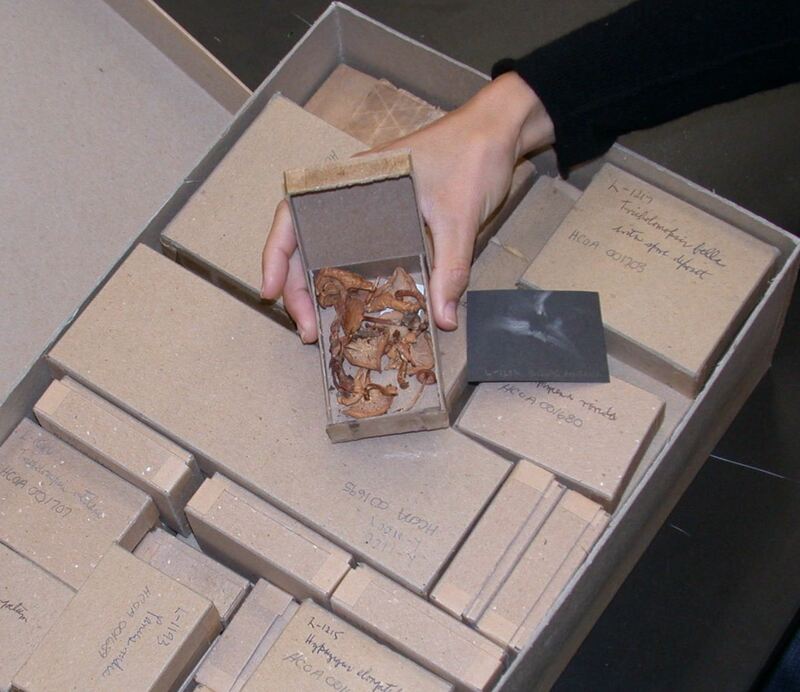 This involves making the official label and placing the specimen and the field notes in a cardboard box. Placement of the official label varies between and even within collections – it is very convenient for future users if the label is glued to the box top where it is easily seen, but to save space and money, we use the smallest possible box for each the collection, and this often means that the label won’t fit on the box top. 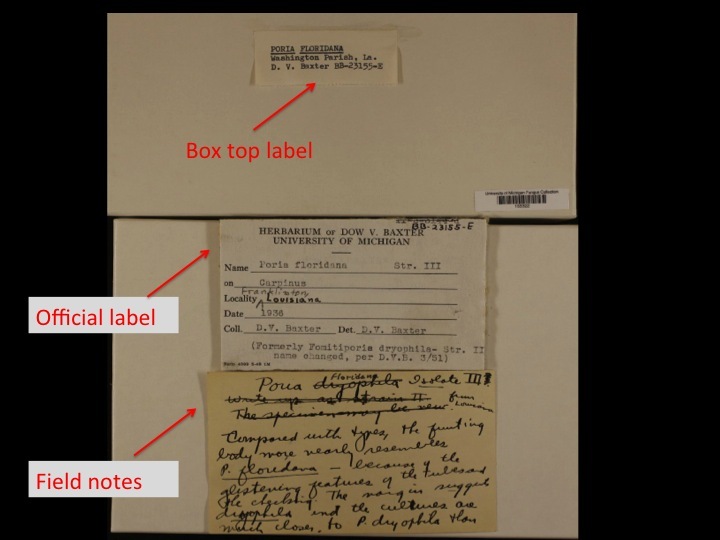 In such cases, the label is put inside the box, and some of the label information, usually the name of the specimen and the collector name and number, sometimes the state or country, are written or printed on the box top. The picture below shows a collection with all three label types. Hopefully, armed with the information presented here, you will now be able to tell which is the official label, which is the box label, and which are field notes when Notes from Nature Macrofungi presents you with multiple pieces of paper to transcribe. You should always transcribe from the official label, but sometimes looking at the box top label can be helpful in interpreting handwriting or abbreviations. If not, please keep posting comments! If you would like to learn more about how mycologists make collection of macrofungi, you can download a document called “Recommendations for Collecting Mushrooms for Scientific Study” that explain the process in more detail: (http://sweetgum.nybg.org/boletineae/collecting_illustrated.pdf). Should we be transcribing anything from the field notes in the “Locality and Habitat” field, or just use the information from the official label? Please just transcribe the information from the official label about where the specimen was collected. You can include the habitat information from the label, if you like, but there is no need to transcribe the field notes. Thanks so much for your help! Thanks! Just to clarify – in the Locality and Habitat field, the most important thing to include is the location (e.g., the city or national park); the habitat information (e.g., on dead tree trunk) isn’t required, but can be included if I want to? I just want to make sure my transcriptions will line up with others’.